1. 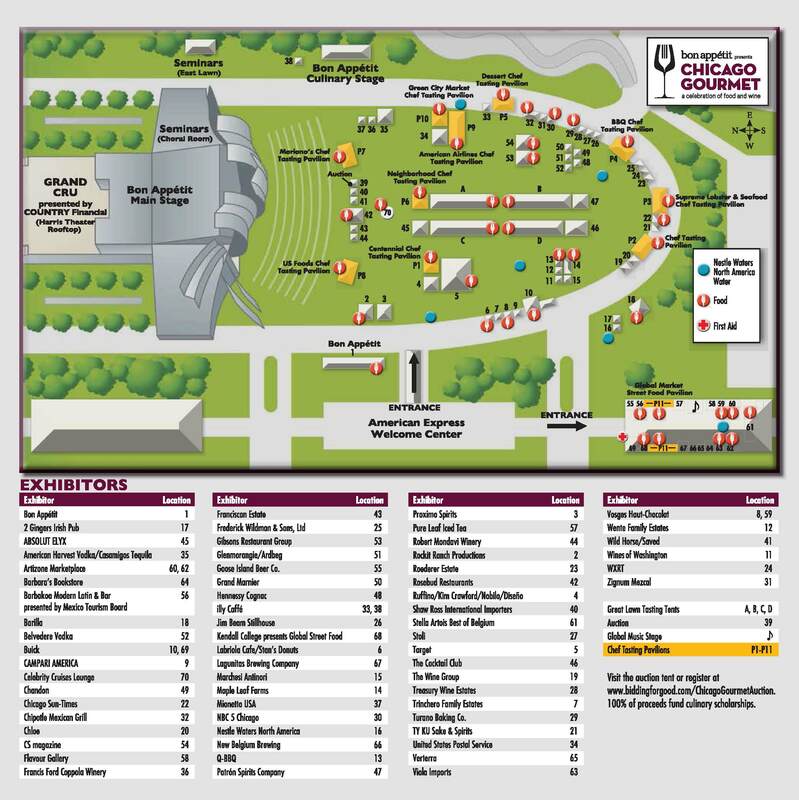 Make a Game Plan:Chicago Gourmet has their full schedule of food pavilions, seminars, food demos, event map, list of exhibitors and chefs, and more online. With 12 different pavilions dedicated to eating and a limited time period in which each chef appears, make a list of your “must-haves” in order to make sure you hit up what you want the most. 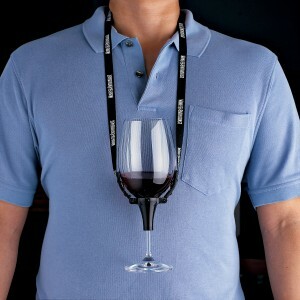 2.Get a Wine Necklace: At Food Network in Concert last weekend at Ravinia they gave each attendee the greatest invention known to the wine-o world, a wine glass holder necklace. I’m not sure if Chicago Gourmet is planning on handing these out (I don’t think they have in the past), but there is still enough time to call a couple of local wine shops and see if they carry them. 3. Talk to the Chefs: I can’t stress this one enough! Some of Chicago’s best chefs are attending this event and they are looking right at you when you get to the front of the line. Say hello, ask how their day is going, make a little conversation, and say thank you. So many people go through lines and grab the food without giving the chefs who have been working their butts off to feed you a second glance. Don’t be that person. 4. Find Out What You Are Eating: Most if not all dishes will have a placard with what dish you’re tasting and I highly suggest you look at it. 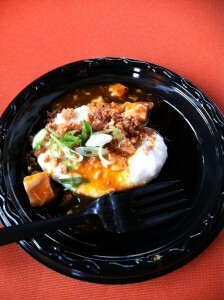 These often include intricate details as to how the dish was prepared. Were the onions pickled, fried, or caramelized? You’ll never know unless you read up, or even better ask the chef themselves! This is also a great way to reduce food waste! If you read the placard for the food and find that a dish is filled with mushrooms and you hate mushrooms, take a pass and save room for something different. 5.Take Care of Yourself: The weather is forecast to be mostly sunny over the weekend but with a range between 57 and 72 degrees, that means dress appropriately, wear layers and even bring sunscreen for your face. Also remember to drink water throughout the day to even out some of that alcohol. 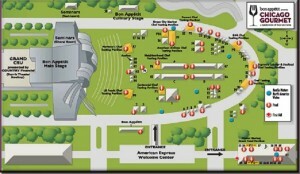 Nestle has five different water stations spread throughout the event grounds to keep you hydrated. 6. Capture the Moment: Even if you aren’t planning on posting every dish to instragram, taking photos is perfectly appropriate for this event. It’s a great way to remember which dishes you liked the best so you can go back to the restaurant(s) and try them again! Sunday on the East Lawn from 3:00pm-3:45pm you can learn how to take the perfect foodie photo at a seminar hosted by Jorge Gera, Jorge Gera Photography and Leigh Omilinksy, Café des Architectes. 7. Have Patience: I’ve found in years past that the middle of the day is often the most crowded and lines for the gourmet pavilions can become very long. Arrive early to beat the crowd (and stay late) and during the mid-day rush enjoy some of the live food demos, seminars, and people watching. 8. It’s a Marathon not a Sprint: Tasting pavilions are open between 12:00pm and 5:30pm, that’s almost five and half straight hours of food. 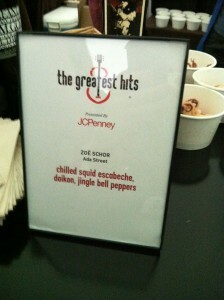 If you’re attending with another person split a dish, unless it looks truly that delectable! Remove half the bun or bread from burgers and sandwiches unless they have crucial condiments. 9. Learn from the Greats: There are 23 opportunities to attend live chef demos throughout the whole weekend. Take a break from eating for just 30 minutes to learn something you don’t know how to do culinary-wise. 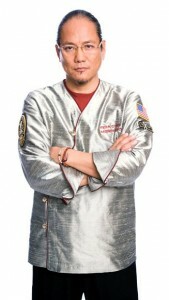 Learn how to prepare a whole fish from Iron Chef Morimoto, discover the joys of handmade pasta with Chicago Italian hall-of-famers John Coletta, Phil Rubino, and Michael Sherrin, or how to make Ramen (not out of the package) from Abraham Conlon, Fat Rice and Takashi Yagihashi, Takashi/Slurping Turtle. 10. 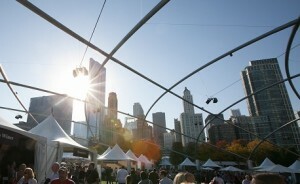 Get Social and Mobile: Chicago Gourmet has an app for that! But seriously, the complimentary Chicago Gourmet app boasts the full schedule, the venue map, and a list of the chefs attending. Not sure if you want to commit to a waiting in line for a pavilion? Check out Chicago Gourmet’s Instagram, Facebook, and Twitter to see if you can get a sneak peek of what’s being served and share your knowledge with others!